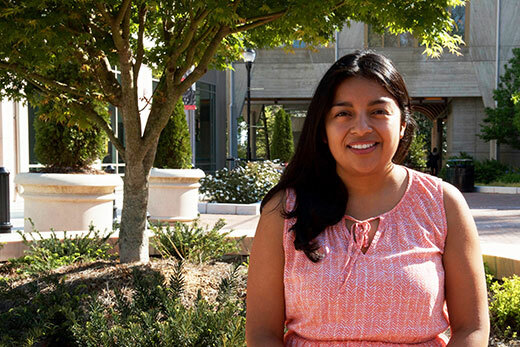 Master of divinity student Ruth Ubaldo will follow her faith to Texas, where she will direct a church community center created specifically by the mostly white congregation to build relationships with the Latino neighborhood next door. Looking back on her time at Candler School of Theology, Ruth Ubaldo sees a theme emerge: crossing borders. A moment in her first year as a master of divinity student still stands out. “I remember walking with a group down to Emory Village, looking around, thinking, ‘When will I be around more people who look like me, who have some shared experience with me culturally? During Mission Year, Ubaldo served at a health clinic for uninsured patients, where she used Spanish, her first language, more than ever before. After Mission Year ended, Ubaldo felt inspired to stay in Atlanta, working as a waitress, table busser and law firm assistant before Candler came calling. In her time here, she’s continued to explore her identity in a number of settings — often ones that cross borders. On campus, she’s a founding member of the Candler Latin American Community (CLAC), which has allowed her to foster Latina identity not only for herself, but also to serve others. As a first-year student, Ubaldo took the course “Church on the Border” with Candler scholar-in-residence Marie Marquardt and associate professor David Jenkins. Over spring break, the class traveled to the U.S./Mexico border with the organization Border Links, based in Tucson. They spent nights in Arizona and Mexico, walked through the desert and met with advocacy groups. It was a formative week then, but even more so now, Ubaldo says, given the current political climate around immigration. She calls her peers from the class her closest friends from Candler. Ubaldo lived in the university’s theology house and took classes in German and English, including “The Bible from an Intercultural Perspective.” She befriended students from Ghana, Hong Kong, Slovakia and beyond. Her time in Germany also offered a chance to reflect on her next steps, thanks in part to the more relaxed European pace. During a jog one day, Ubaldo’s listening paid off. And so her calling to cross borders starts a new chapter. After graduation, Ubaldo will join the staff of Faith United Methodist Church in Richmond, Texas, as director of the church’s community center, a space created specifically by the predominantly white congregation to build relationships with the Latino neighborhood next door. But first, she must say farewell to Candler.